We've said it before, and we'll say it again—content marketing can be tough. Creating content without a target audience is like Hall without Oates, peanut butter without jelly, Carly Rae Jepson without 'Call Me Maybe'….essentially, it just doesn't make sense. Using a customer market research survey is a fairly quick and efficient way to identify an audience and start brainstorming content strategies that will keep current customers interested and convince potential customers to convert. By using the information found from a simple survey, we can begin to understand our audience and figure out what the heck we should be creating for them. In her recent post, Distilled SEO Consultant Stephanie Chang talked about the framework for building a content marketing strategy - surveys make up an important part of the structure, and here are some tips on how to execute them specifically. Occasionally, clients will come into the outreach process with very little knowledge or understanding of whom they should be targeting. Building content without knowing who it is for is like shooting at a bullseye while wearing blinders; any success is just dumb luck. Just like a potential customer will ask questions before buying a product, we must also ask questions to figure out who is interested in a product or service and why. Before we can deliver the right message to the right people, we have to figure out what that message is, which means becoming detectives and answering some questions. Who is our average customer? Why are they interested in the product or service? Who or what motivates an individual to purchase the product or service? What do people value about the product or service? What do they like and/or dislike? Using these insights, we can start to answer the 'who' and 'why' in order to create the 'what' for our content strategy. A survey is only as good as the questions it asks – the last thing you want is a bunch of data that leaves you more confused than when you originally started. DO start off the survey by clearly stating what the incentive is and how they can enter to win (usually by entering an email address). DO include at least 1 or 2 open-ended questions that allow customers to provide broader, more personalized feedback. DO make 'Other' a possible answer on every single question and provide a comment box for the participant to explain. DO require that participants answer every single question, even if it means checking 'Other' or 'N/A'. DO avoid biases in the questions and answers. Phrasing should be neutral and should not 'lead' respondents to a particular answer. DO include a variety of different question formats: multiple choice, ranking, and open-ended will keep the survey from becoming stale quickly. DO include a progress bar, so participants can track how far along they are in the survey. A progress bar can lead to a higher completion rate overall. DO always beta test the survey and reword the questions testers find confusing or misleading. DON'T be afraid to ask as many questions as you need (but obviously be considerate of participants' time). The more feedback you have to work with, the more correlations and educated assumptions you can make. DON'T make questions overly wordy or complicated. DON'T write double-barreled questions – AKA don't combine two questions into one in an effort to shorten the survey length. Survey providers like SurveyMonkey and AYTM offer free options for conducting a basic customer market research survey, but the word "free" does come with limitations. Certain question structures and general freedom of design are unavailable without a membership. Paid membership offers more flexibility in the design and formatting of the survey questions, and may be worth the investment if you need to create multiple surveys throughout the year. If you need a one-time survey either of the free services should take care of the job, just as long as you are willing to put up with one or two advertisements and formatting limitations. Before you can get results, you have to get people to open the email. Keep it brief and make it easy for a person to access the survey. Don’t forget the subject line too---you want to interest the reader and also call them to action. Personal opinion: west coast is the best coast, but when it comes to shipping a survey, stay on EST and avoid high traffic email hours when your message is more likely to get lost or avoided in the inbox shuffle. Avoid Monday mornings when inboxes will be stuffed with overflow from the weekend, and avoid evenings when most people have peaced out for the day. For the initial email invitation to participate, schedule it for a Tuesday morning at 9 AM EST. By Tuesday, most of the catch-up from the weekend should be complete, and 9 AM ensures that most people will be at their desks with their inboxes open, or it will be waiting there at the top of their inbox when they get into the office. Spoiler alert – not everyone is going to be interested in helping just because you asked. Provide incentives and make it clear in the email copy (and subject line) that there is an opportunity to be rewarded. Gift cards from companies appeal to everyone and are a great way to convince people to get involved. Are incentives always necessary for success? No, but it will greatly increase your response rate. The idea of compensation or a reward can be highly motivating, but occasionally, just providing a stage and an opportunity to be heard is enough. People are busy. Don't expect them to take your survey the minute you ask, but also don't expect them to automatically remember to take it later. The survey should remain open for at least a week to give people time to respond, and to anticipate customers with an "Oh, I'll get around to this later" attitude, sending a quick reminder email 48 hours before the survey is scheduled to end can greatly increase the overall response rate. The quick reminder will encourage individuals to take immediate action, especially if they want a chance to win any extra incentives associated with participating. Once the survey results are in, it's time to roll up your sleeves and get to work. Organize the information and start making some top-level assumptions regarding who you should be targeting and how. Something as simple as a slide deck presentation can be a great way to organize and visually present the data at hand. Create an individual slide for each question that was asked, and draw conclusions based on customer feedback. Below are examples of three questions used in a recent customer market research survey, and the assumptions that resulted from each response. Survey Question: What social media networks do you personally use? 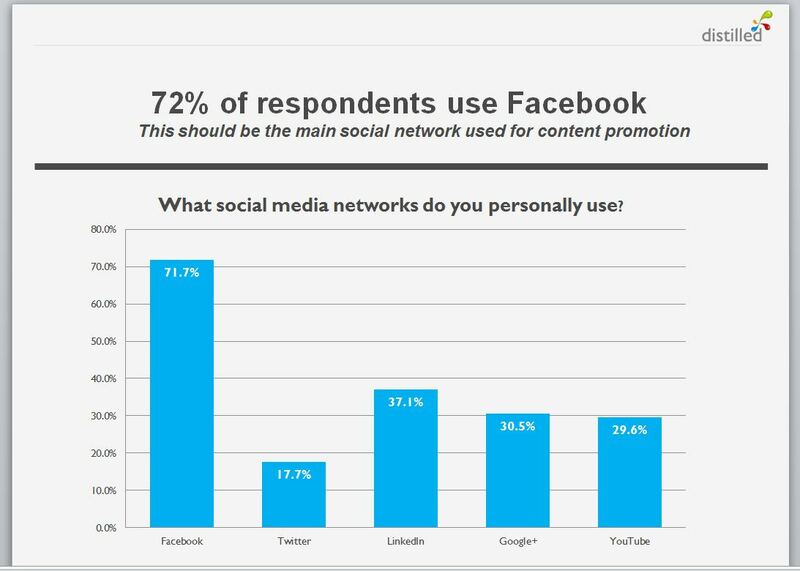 Assumption is that Facebook should be the main social network used for content promotion. 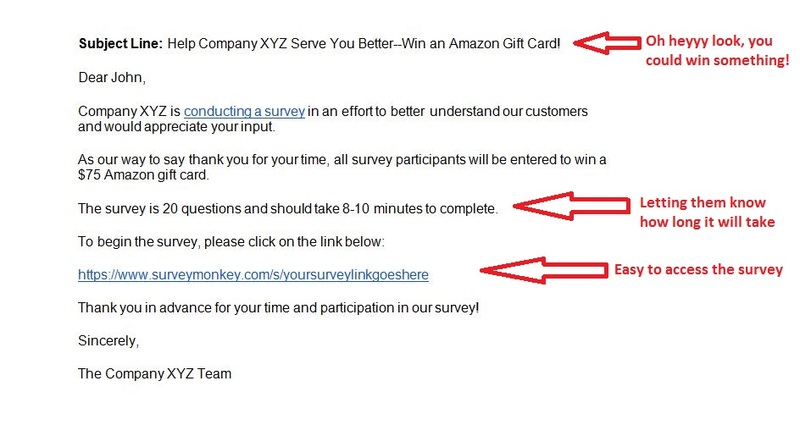 Survey Question: Would you be interested in attending a customer event for Company XYZ? 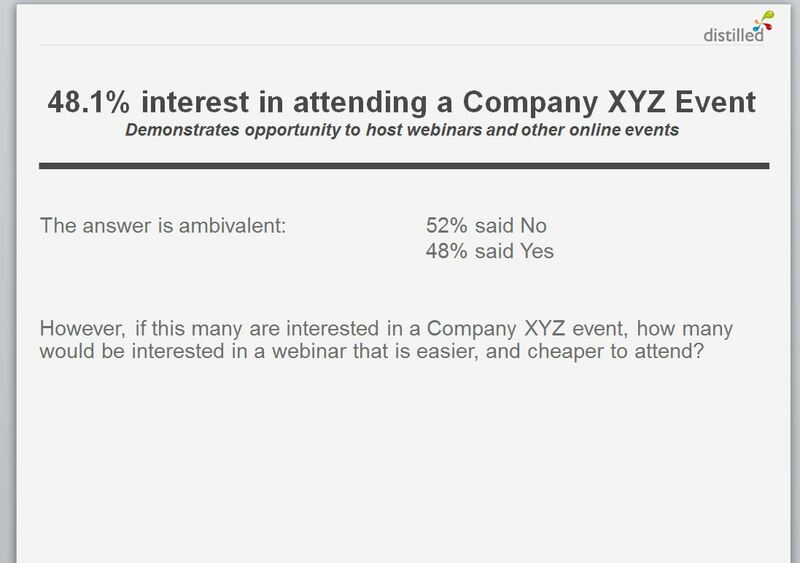 While certain audience members are already interested in attending a Company XYZ event, there is potential to attract an even greater response if events are hosted online. Survey Question: What areas of Company XYZ would you be interested in learning more about? Assumption is that audience will respond well to content centered around future products and product training. The more questions you ask, the more detailed you can get with your audience assumptions and the more valuable the survey will be for establishing a long-term content marketing plan. Survey results can offer a fascinating glimpse into what makes your audience tick—use this information to your advantage to build content your target market will want to read and share.